Japan boasts towering skyscrapers and bustling metropolises like Tokyo, Yokohama and Osaka. But the country is also home to beautiful gardens, rich heritage sites and age-old temples. In the Chugoku region, at the southwestern tip of Honshu, you can explore some of these attractions. Enjoy a slower pace of life away from the big cities, and take your time to discover iconic historical and cultural landmarks off the beaten track. Here are four that you should not miss. Located in Okayama city adjoining Okayama Castle, this is considered to be one of Japan’s three best landscape gardens (along with Kenrokuen in Kanazawa and Kairakuen in Mito). It was awarded three stars in the Michelin Green Guide Japan. Built in 1700 by the local feudal lord, the garden preserves much of its original design and incorporates rice fields, tea gardens, and groves of cherry, plum and maple trees within its extensive grounds. Featuring a large pond, streams, walking paths and a hill that functions as a lookout point, Korakuen fulfills all the classic elements of a landscape garden. You can also enjoy beautiful vistas of Okayama Castle from various spots in the garden. When you visit, be sure to drop by the crane aviary near the main entrance. While the birds are usually kept caged, they are occasionally let out from November to February on some Sundays and national holidays. Korakuen Garden is located a short 10 to 15-minute walk away from Shiroshita tram stop, three stops from Okayama JR station. Bonus itinerary: Kurashiki. Located a quick 35-minute drive away from Okayama, Kurashiki boasts a quaint historical quarter that you can explore, complete with a scenic canal and traditional Japanese architecture. The region is famous for its denim, so you can even rent a denim kimono to wear for some unique photos. Visit www.okayama-japan.jp/en/ for more information on things to do in Okayama Prefecture. Also known as Izumo Oyashiro, this is one of the oldest, most famous and most important Shinto shrines in Japan. Located in the city of Izumo, in Shimane Prefecture, it is popular with both Japanese and international tourists. Okuninushi-no-Okami, the deity enshrined at Izumo Taisha Grand Shrine, is said to govern the realm of the gods. According to legend, all of Japan’s deities (kami) gather at the shrine during the 10th month of the lunar calendar every year to hold meetings with him and with each other. The place is especially popular with young women who make wishes for romance. The shrine boasts Japan’s largest shimenawa, or Shinto straw rope, measuring 13.5m in length. Shimenawa demarcate the boundary between sacred and secular spaces, and can be found at other holy sites across the country. As you walk around, you will find various cute rabbit statuettes, due to a myth that the shrine’s kami helped rabbits in the past. There are notice boards with QR codes on all four sides of the main hall, allowing you to learn more about the history of the place and the myths surrounding it. From Izumoshi JR station, visitors can take a bus to the entrance of Izumo Taisha Grand Shrine. You can also take the Ichibata Electric Railway from Dentetsu Izumoshi station — which is located next to JR Izumoshi station — to Izumo Taishya-mae Station. Bonus itinerary: Tsuwano. A small, beautiful town nestled in the mountains of Shimane Prefecture, Tsuwano is home to a variety of traditional crafts like sake brewing and washi paper making, as well as exquisitely preserved homes from the samurai era. It is dotted with shrines and temples, including a 19th-century Catholic church with tatami mats for pews (rebuilt in the 20th century), and boasts a canal filled with hundreds of carp that you can feed. Visit www.kankou-shimane.com/en/ for more information on things to do in Shimane Prefecture. Colloquially known as the Cat Temple, this place is dedicated to all things feline. Perched on a hillside in rural Yamaguchi Prefecture, the temple has a 400-year history, but has only recently become a tourist attraction. It was built in honour of a cat who showed immense loyalty to its samurai master. Cat lovers will find much to delight them — the place is filled with cat memorabilia and trinkets of all kinds, including a row of full-face cat helmets that you can try on. The temple is run by a friendly Buddhist monk, who welcomes visitors with a smile. You can draw a cat on a wooden template and write a wish on the other side — this will be hung up in the foyer. You can also purchase various lucky charms and cat-related souvenirs. If you keep your eyes open, you might even spot a real cat wandering around the premises. Bonus itinerary: Hagi Seaside Market. Located a 30-minute drive from Unrinji Temple, this seafood emporium in the style of a traditional Japanese public market has 17 stalls selling locally caught fresh fish, seafood and other marine products. It also houses seafood restaurants and souvenir shops for you to get a taste of the local cuisine for yourself. Visit www.visit-jy.com/en/ for more information on things to do in Yamaguchi Prefecture. With an iconic vermilion torii (a traditional Japanese gate which symbolically marks the divide between the sacred and the mundane), this is one of Japan’s National Treasures and a UNESCO World Heritage Site. It is also one of the Three Views of Japan — a list of Japan’s most celebrated scenic sights compiled by the 17th-century scholar Hayashi Gaho. Located on Miyajima Island a short ferry ride away from Miyajimaguchi, the shrine is situated on the shoreline, where tides rise and fall. During low tide, you can walk out to the torii 200m from the entrance to marvel at it up close, while at high tide the gate appears to be floating on the water, providing for scenic and memorable photos. Itsukushima Shrine is a complex of various buildings that are built over water. Apart from the main shrine and torii, you can also enjoy the vivid craftsmanship of the Marodo Shrine, which you will pass as you enter. 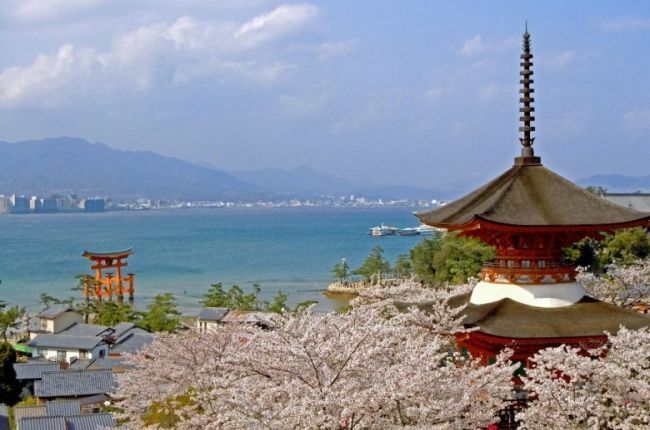 You will also see Japan’s only Noh stage constructed over water as well as the vibrant vermilion East and West corridor, a popular spot for photoshoots, which connects Itsukushima to Marodo. Afterwards, explore Miyajima’s Omotesando shopping street for a taste of freshly grilled oysters or delicious momiji manju (maple leaf-shaped castella cakes with red bean filling) — the island’s speciality. You can take a ferry to Miyajima from Miyajimaguchi ferry terminal, a short walk away from Miyajimaguchi JR station. Bonus itinerary: Okunoshima. Also known as Rabbit Island due to the approximately 700 wild rabbits that roam its shores, Okunoshima is a favourite tourist destination for the young and old alike. It is a 15-minute ferry ride away from Tadanoumi Port in Takehara City, where you can purchase small bags of treats with which to feed the rabbits. Visit www.visithiroshima.net/ for more information on things to do in Hiroshima. SilkAir, the regional wing of Singapore Airlines, currently flies directly to Hiroshima every Monday and Thursday. From 25 February 2019, the airline will resume its services on Sunday, and flies directly to Hiroshima three times a week. SilkAir offers spacious legroom, in-flight refreshments such as Japanese green tea, and on-board entertainment via its free SilkAir Studio app featuring movies, TV programmes and music albums. The airline also offers complimentary baggage allowance. Visit www.singaporeair.com/japan for more information.